When his sister Ruthie died, Rod Dreher found himself drawn back to his hometown of Starhill, Lousiana. He appreciated Ruthie’s “little way”—her life of close-knit family, down-home neighbors, and ordinary kindness that, though not garnering headlines, was nevertheless rich in love. While happily married with children, Dreher felt that Ruthie’s “little way” supplied was lacking in his and his family’s urban existence; so, they moved to Starhill. The problem was that Dreher had left Starhill for a reason: The inability of his family—especially his father, but even Ruthie herself—to understand any way that wasn’t their way. The family had stayed put; Dreher had traveled abroad. They were Methodist; he was Methodist-turned-agnostic-turned-Catholic-turned-Orthodox. They did stuff; he read books and wrote articles. Dreher felt that wasn’t a choice. There must be a way to stay put and find inner peace. While browsing a book store not long after the conversation with his doctor, Dreher chanced upon Dante’s Inferno, the first of three volumes in The Divine Comedy. 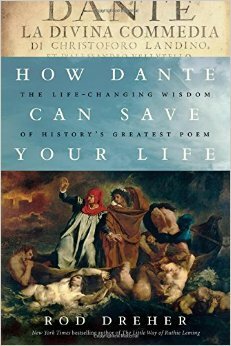 How Dante Can Save Your Life is the story of how Dante saved his. This desire for self-will over God’s loving will, Dreher realized, was the cause of his family’s estrangement and the source of his own sickness. Dreher the Orthodox Christian did not agree with all the details of Dante the Catholic poet’s theology—nor do I the Pentecostal reader, but that disagreement doesn’t mean discounting Dante’s brilliant spiritual insights into “the Love that moves the sun and all the other stars.” And in finding that godly love, Dreher found himself whole. Those looking for an introduction or running commentary on The Divine Comedy should look elsewhere than this book. It’s not for them. Those looking for a self-help book that doesn’t rely on the structure and reasoning of a 700-year-old poem also should look elsewhere. But those who believe that great books have therapeutic value if read insightfully and personally will be delighted by Dreher’s testimony and the gentle nudge he presses on readers to follow in Dante’s path. If you found my review helpful, please vote “Yes” on my Amazon.com review page.